The Special One. 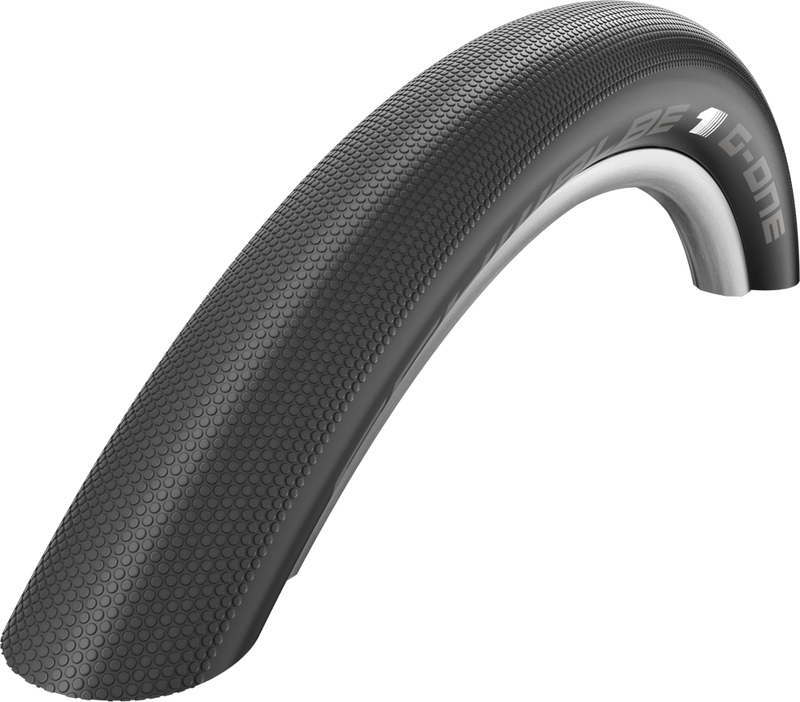 The Schwalbe G-One Speed TL-Easy Evolution is the fastest tyre in the G-One family. With V-Guard protection the G-One Speed features and even faster rolling tyre tread and is designed for riding on roads and off-road tracks and trails when conditions are dry and hard-packed. Met my expectation based on the many excellent online reviews. Fast and comfortable. Great tyres. Very grippy and fast on both sealed and unsealed roads. These tyres are exactly what I`ve been looking for, great for Sunday morning ride outs and great on gravel tracks. I was worried I might get dropped with my gravel bike on road ride outs but, not with these tyres. I tested them on a rainy day on gravel roads and they coped really well. Slide a bit on mud but that`s to be expected. I was going to run two sets of wheels but now I don`t need too, these are perfect! Great tyres. Very pleased with extra cushioning from running at low pressure. Easy to fit. Only regret is I didn`t get wider tyre (loads of clearance to spare). I`ve been using 28X700c Schwalbe Pro Ones for a couple years. I decided to try the 30mm G Ones. Bike is a relaxed steel road bike. The G Ones ride similarly to the Pro Ones, but quieter. Subjectively, I`d say speed is very close and only slightly heavier climbing or accelerating. I was looking for a little more durability than the Pro Ones. Well see how that goes. I use Orange Seal. I commute a lot of miles and these tires really last. Great tyres - comfortable and grippy. Good service from Merlin. These tires rock. Best all around tire on the market if you ride rough road/fast gravel. A simple tire pressure change replaces the need to swap out tires to match the terrain. For racing, they are good for fast gravel, but if you're not racing on them, then they are good for everything. These tyres are the holy grail of tyres in my opinion. After 5000km on the 30mm tubeless, I thought I'd try the 35mm. Rode a 130km route on all road surfaces with 1300m elevation, first I rode it with the 30mm, 28.6kmh average speed and 208 average watts from my power meter. Mounted the 35mm tubeless of course, no hassles, and rode the same route. Felt slower on the climbs, however the stats say otherwise, same identical figures, yes, 28.6kmh and 208w. Power meters don't lie, these 35mm (which have stretched out to 38mm on 21mm internal rims), are equally as fast (at the same effort) as the 30mm. The difference, comfort, the 30mm are fantastic, and I've previously stated, if they fit buy them. Well, the 35mm is super comfortable, what happened to that rough Australian Chip Seal road? Smooth... If they fit, get them! 30mm stats - measure 31mm on 21mm internal rims, front tyre was good for around 8000km, rears squared off around 4000km. Over 8000km and three tyres one only puncture (6mm cut), lots of small cuts but no other actual punctures. Grip well wet or dry, even on hard pack gravel. My usage mostly for distance road riding, these are the best I've every ridden, Thanks Schwalbe. Great service & price from Merlin as always. The tyres do what they say on the box, they set up tubeless very easily, they're comfortable and work well on rough surfaces, I ran them 50psi front, 60psi rear on the cobbles of Flanders and it felt about right. They measure up at exactly 30mm on 23mm wide rims, to be honest I was slightly disappointed with this as I have Pro Ones in 25 and 28 that measure 29 and 31 respectively. I expected these to come up around 33mm or so, but they are true to size. Recommended if they're the right size for your bike. Just installed these the day before a 150 mile long gravel race and they were fast as hell and held air with no issues. I'm sold, will buy again! Chose these for my 2016 Kona Roadhouse custom build. Superb tyres! Best tyres ever used in 55 years of riding. Supple, smooth and low rolling resistance. Running 75 rear 65 front on road and bike paths, lower on gravel. Fitted easily with tubes on 19mm DT tubeless ready rim. Great price, rapid dispatch and received without delay at busy time of year. If these will fit your bike do not hesitate to order. Excellent tire, seals right up tubeless with a floor pump... amazing deal at this price! Light, fast and no punctures after the first 1500km or so. Run tubeless for best performance. Perfect for light offroad use and that rare blend of fast and cushioned on-road. Love these tyres. So much more grip than the Hutchinson Sector 32's which tried to kill me whenever the roads were damp. Merlin's was service excellent as usual. Having ridden Schwalbe One Pro tubeless on the road quite happily I put these sold out in the USA tires (thanks Merlin for having them in stock) on my gravel bike for the 2017 Belgian Waffle Ride, (Look it up: 212 km, 65.6 km dirt, 3352m climbing) replacing the 38mm G-one tires I'd been loving. Great call! They roll very nicely indeed on the tarmac and handle dirt, gravel, sand, rocks and whatever else there was with great aplomb. Excellent tires for all kinds of mixed conditions. There were a lot of punctures on this ride - not me! Excellent tyre, a wonderful size too, not too wide and sluggish but wide enough to absorb most bumps etc.